On Location is a new series of posts about places which feature in my novel, minus the context. So the focus is on the place and why I think it’s interesting, NOT the part it plays in the book. (I hope you’ll find that out one day when you read it !) I’ll throw in a few red herrings while I’m at it. It’ll probably seem a bit of a random collection but that doesn’t matter. The randomness of things is what the book is really all about. Whether you know these places or not, I hope you enjoy On Location. When after my first term in an entry-level creative writing class, my tutor invited me to join a small novelists’ group, it wasn’t just a really exciting time for me as a writer (maybe I could actually be one), it led to me appreciating a part of London that had never held any appeal. For over two years, we’ve met fortnightly, first at the National Theatre, then at the Royal Festival Hall, which have huge foyers where people are free to sit around for hours on end – they seem to attract a lot of ‘creatives’. The Southbank Centre is known as much for the brutal style of its architecture as for its wonderful music, theatre and art. Sadly, concrete doesn’t age gracefully, but that’s not important once you’re inside. The area wasn’t entirely unfamiliar to me. I lived in Camberwell, a Tube-less area of South London for four years after leaving university and crossed Waterloo Bridge on the 68 or 176 bus countless times, but I only admired the view looking north. Waterloo Station was my point of arrival on rare family trips from Salisbury, and later, at 17, the scene of torrid reunions with Daniele, a waiter at The Savoy who I’d met on a cross-channel ferry, that is, until I figured out what every woman knows deep down about Italian men. How on earth did I get onto that? The South Bank now is far more attractive than I remember it. In good weather, walking the wide path along the river to Tate Modern and the Millennium Bridge is one of my favourite things to do in Central London and so is lunch on one of the restaurant terraces. This summer there was a fun, vibrant atmosphere and lots going on for the 60th anniversary of the Festival of Britain which gave the Royal Festival Hall its name and which inspired the very existence of the arts complex. 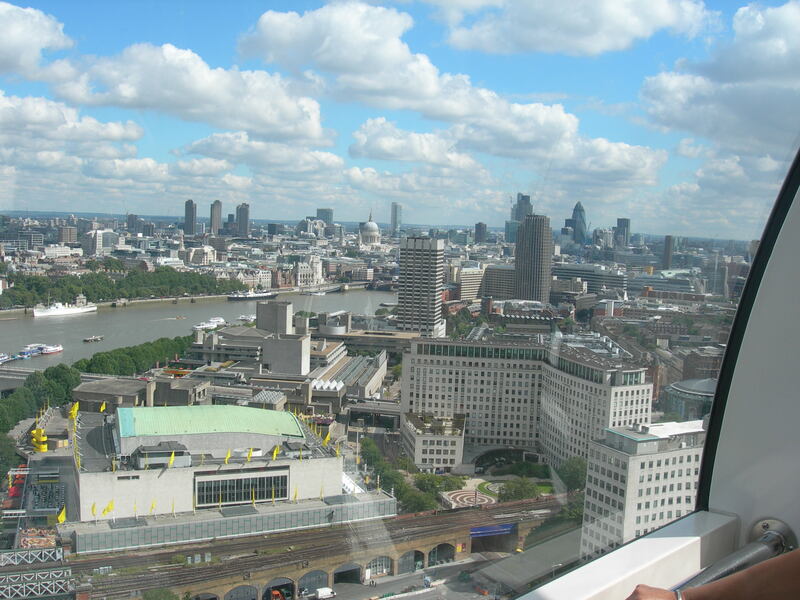 The retro-cool Skylon restaurant has panoramic views of the Thames and is one of my absolute favourite places to eat out. 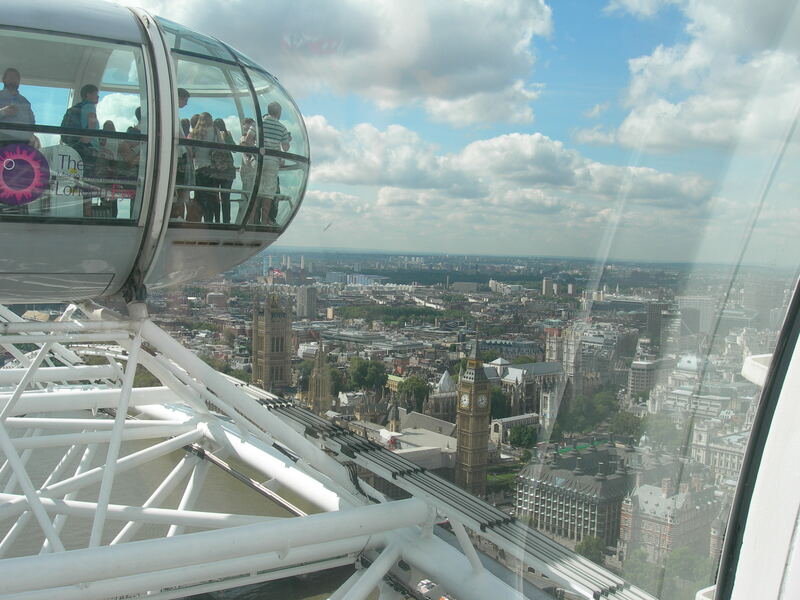 Of course the London Eye is one reason the area draws so many visitors. I’ve been on it with each of my sons and on a clear day the views are spectacular. We were excited to spot Alexandra Palace up on its hill (very near our house) and the arch of Wembley Stadium, and in reverse, when we stand in front of Ally Pally looking over London, the wheel has become one of the landmarks to look for. I get to the South Bank either by walking down the side of Trafalgar Square from Leicester Square Tube and over the Hungerford pedestrian bridge, or, my favourite, getting off at Holborn and walking over Waterloo Bridge. Strangely, the weather is almost always glorious (I’ve never taken a photo but when I get one which captures the mood I’ll add it). I always feel a mixture of anticipation and trepidation on my way to writing group and, as I cross the Thames, a surge of emotion at the view on either side of the bridge. Although I’ve lived in London half my life, it can still do that to me. If I have time, I nip into EAT café under the Festival Hall to grab a coffee. There’s a Spanish barista there with an angelic smile that could dissolve stone. What is this “Skylon restaurant”? Surely this is what has always been known as the People’s Palace and should remain so. Please preserve a few memories of the early post-war years with its socialist ideals, when the NHS was formed and collieries were nationalised “on behalf of the people” as the notices at the gates proclaimed. (or, if you prefer, of the time of austerity when George Orwell’s 1984 was written). That is what the South Bank is all about. Whilst on the subject: the wonderfully cool original 1950s/early 60’s interior of the NFT cafe has now been ruined by naff Wetherspoon pub style furnishings. 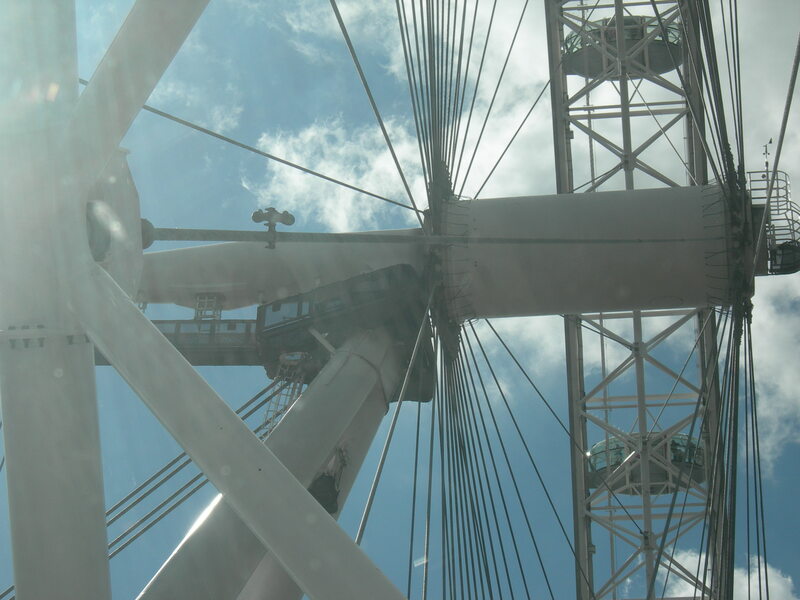 And by the,way, it’s called the BIG WHEEL, for that is what is looks like. It doesn’t look line an eye. Now in a more positive mood:, for me dancing Argentine tango in the beautifully restored Clore Ballroom inside the Festival Hall, with live orchestra, on Boxing day during an otherwise tedious Christmas period is one of my great memories of the South Bank. Sometimes there is also free traditional ballroom dancing in the Clore Ballroom (which I can’t do) and to see, for example, a stylish slow foxtrot, again with live orchestra, danced in this venue by people who are just social dancers brings out what a beautifully designed building the Festival Hall is.and why it really is a people’s palace. Berlin has now, sadly, lost its former DRR people’s palace, the Palast der Republik. Here is a commemorative YouTube clip: see the magnificent interiors in the beginning! Thanks Tom for sharing your own experiences of the Southbank Centre and filling everyone in on its ideological roots. I loved your tales of dancing in the Clore Ballroom. And as for that clip about the People’s Palace in Berlin – I LOVED it – the music was a real tearjerker. What a travesty that they have lost that building when 60% of Berliners voted to keep it (for those who don’t speak German). You know about my love of all things (almost) Ossi and of Berlin. Haven’t been for 3 years and thanks to you I now really want to go. Perhaps I could go and make that one of my red herrings for this series ?! Willst Du mit mir in die Postmodernismus-Ausstellung bei der V&A gehen? Hab Dein DVD gefunden aber noch nicht angesehen. Junktim, machen wir. Wen und wo? (Nicht Donnerstags bitte). Now further in English: I appreciate the idea of socially constructed reality – and quite often it even rather makes sense and you see it at work, (like the commercial and/or political manipulations involved in naming or re-naming things), but I need educating in the appreciation of postmodernist artifacts for I am full of prejudice about them, such as: is it all just a kind of knowing (ironic or not) display of self-conscious quotations from other artifacts – like a skin which covers emptiness (think of an onion which is nothing but skins)? We do the same in language on occasions when we choose to speak knowingly and self-consciously in cliches. In architecture, especially the more commercial kind, we now see a lot of postmodernist modernism, i.e. modernist quotatations dressing up rather workaday constructions which definitely do not aim to innovate anything. (And I am not first one to notice the sad paradox of quoting modernism as a historical style). I am waiting for postmodernist postmodernism, i.e. when the postmodernist start quoting themselves. The Royal Academy’s exhibition “Building the Future – Soviet art and Architecture 1915 – 1935” seems fascinating in this respect. I imagine that the architects and artists would probably rather have their work destroyed than see it misused as a source of ornamental quotations in the capitalist production and marketing of commodities (probably including the idea of historical exhibitions of their work for which a entrance fee is charged). Would still like to see that exhibition, though. We have al been infeced by PoMo. In other words, is postmodernism about commodifying everything? (I am obviously making all this up as I go along).